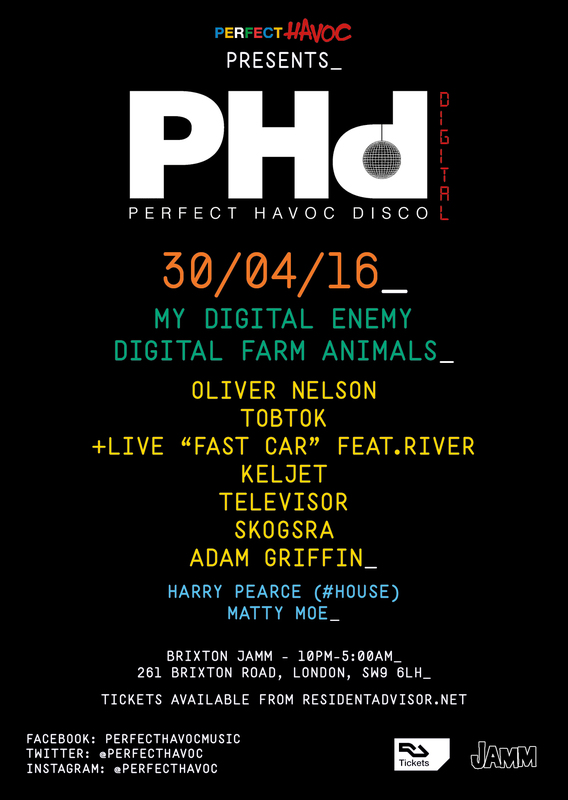 London’s freshest club night, Perfect Havoc Disco, returns for a bank holiday shindig on Saturday 30 April at Brixton Jamm with the best in British and Swedish dance music DJ talent. The line-up features the cutting edge house duo, My Digital Enemy, nu-wave duo Digital Farm Animals, Sweden’s most in-demand nu disco exports, Oliver Nelson and Tobtok, plus more breaking talent – Televisor, Kelijet, Skogsrå and Adam Griffin. With two huge parties at Shapes and Hoxton Basement already under its belt, Perfect Havoc Disco is now ready to get its jam on, south of the river at Brixton Jamm. Also a record label and artist management agency, Perfect Havoc is dedicated to showcasing genuine breaking talent. Its bosses have a keen ear for spotting the ‘next big thing’, and the forthcoming lineup at Brixton Jamm exemplifies this very talent. Making their Perfect Havoc Disco debut are Brighton producers My Digital Enemy, known to their pals as Serg and Kieron. Their forward thinking production has bagged numerous Beatport #1s, with tracks like ‘Shamen’ and ‘Don’t Give Up’, Radio 1 airplay from Annie Mac and Pete Tong, and dozens of releases on labels including their own Zulu Records, Toolroom, Stealth, Spinnin, Skint, and more. Their headline set at Perfect Havoc Disco is not to be missed. London DJ / producers Digital Farm Animals are next on the bill, bringing an eclectic mix of bouncing nu- wave and their huge new single ‘Wanna Know’, which was not only awarded Danny Howard’s ‘Future Anthem’ but Pete Tong’s ‘Essential New Tune’ too! Hear it for yourself on the dancefloor at Brixton Jamm. As with any Perfect Havoc Disco event, there will be an injection of the finest Swedish DJs and producers. Arguably Sweden’s biggest export right now, is 25 year old Oliver Nelson. 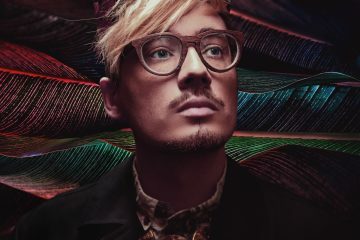 His rapid rise to success is due to his expert remixes for Janet Jackson, Luke The Knife, The Wombats, Route 94, and Tove Lo, and his Hype Machine #1 debut track, ‘Found Your Love’, released on Polydor this May. Oliver’s productions have amassed a staggering 45 million plays on Soundcloud and 50 million on YouTube! ‘One to Watch’ talent doesn’t come more real than this. Hot on the heels of Oliver Nelson is fellow Swede Tobtok, who will step up with his stylish take on tropical house and nu-disco. His production credits include remixes for The Magician, Blonde, and Citizens! and signings to Kitsuné and Good Solider. More recently, his massive rework of ‘Fast Car’ (signed to Atlantic Records) has turned out to be his biggest single to date, with 14 million+ streams on Spotify and 2.52 million on Soundcloud. The release went gold in Australia and hit #10 on the Billboard Hot Dance charts. 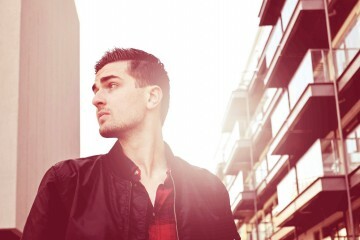 Catch Tobtok perform ‘Fast Car’ live at PHd with the brilliant vocalist, River. Also from the Perfect Havoc Roster is the funky disco Dutch / English duo Televisor. They’ve released on Canada’s biggest dance label Monstercat and been enlisted to remix Icona Pop, Patrick Baker and Tobtok to name a few. But 2016 is looking to be their biggest yet with new single ‘Sound of Love Feat. River’ due for release on Armada Music, and their first outing mixing Toolroom’s Ibiza Poolside 2016 Compilation. Another hot talent to keep an eye on! Dropping some Dutch Disco on the night is the multitalented outfit Keljet, a duo whose bootleg of The Temper Trap’s ‘Lost Love’ gave them viral success, support from Kygo, The Knocks and Oliver Heldens. It also paved the way for official remixes and their debut EP ‘Transatlantic’, which is out now. Singer, producer and DJ, Skogsrå will bring his unique indie dance sound to the proceedings. As a producer he first caught the attention of Perfect Havoc with his debut single ‘Now You See’ me, but it was his vocal talents that saw him write and perform on Oliver Nelson’s first single ‘Found Your Love’ under the alias Heir, a track which to date has clocked over 1.59 million plays on Soundcloud! Completing the bill is Perfect Havoc Disco boss and ex-Sony Music marketer, Adam Griffin. His underground house sets at previous PhD parties have kept crowds dancing until the early hours – expect to stay out til late at Brixton Jamm! There is a genuine buzz around all these artists as they lead a new breed of English and Scandinavian talent. Come down to Perfect Havoc Disco at Brixton Jamm and see for yourself. Early bird tickets are now on sale from Resident Advisor for just £8 – an absolute steal.